Breast cancer survivors and others can use the Free Open Source 3D Customizer to design and produce breast prosthetics. As the market for 3D printers has moved from sophisticated, experienced designers into the mass consumer market, individuals are saving substantial money with pre-designed, DIY products made on 3D printers. These opportunities are poised to increase due to the Free Open Source 3D Customizer, a libre, 3D model customizer that anyone can use to create their own 3D printed designs. To demonstrate how the software works and the possibilities that it creates, I'll show how breast cancer survivors and others can use the Free Open Source 3D Customizer to design and produce 3D-printable external breast prosthetics. But first, a recent history lesson. Early 3D printer users were generally sophisticated designers. They were experienced with traditional computer aided design (CAD) packages as well as a script-based CAD package called OpenSCAD, which dominated the early designs for the RepRap 3D printer, as it was the first mature coding environment and language for modeling 3D objects. The mass consumer market for desktop 3D printers has grown recently, as individuals have become interested in designing and prototyping their own products, as well as saving money through the economics of distributed manufacturing. These users have relied on the millions of free and open source 3D printable designs available in dozens of free online repositories, most notably Thingiverse, which has over 2 million free designs due in large part to its customizer app. This proprietary customizer enables designers to upload OpenSCAD code so average consumers, who generally lack the technical sophistication to create their own designs from scratch, can use it to easily create custom designs and manufacture products themselves. Unfortunately, Makerbot, which was an early open hardware hero, later became closed source. The early, technically savvy "maker" customers (who helped develop the RepRap hardware that Makerbot was based on) largely viewed Makerbot's abandonment of the open hardware ethos as a betrayal. Many of the best designers boycotted Thingiverse, refusing to share new designs and even stripping down popular designs on the repository. This led to fracturing of the open source 3D design community. In addition, Thingiverse's customizer app was locked away by a proprietary company that changed the license agreement to force users to "irrevocably waive (and cause to be waived) any claims and assertions of moral rights or attribution with respect to your user content." This forfeiture of design rights is unacceptable to many open source designers, because it means the company is ignoring the license they choose for their work. Clearly, there's been a widespread need for a free and open source 3D model customizer that can be used in any 3D printing repository for customizing OpenSCAD code. The Free Open Source 3D Customizer fits that criteria. Making the software available to all repositories prevents user lock-in (in the event a repository changes its license agreement) and truly democratizes design. In a study on the design, function, and validation of this free and open source software, we used the example of customizing a breast prosthesis as one way it could benefit many people. In both the developed and less developed world, breast cancer is the most common type of cancer in women, with over 1.6 million new cases per year worldwide. Cancer treatments have improved, and patients with breast cancer can expect to significantly extend their lifespans with surgery and chemotherapy. Unfortunately, losing all or part of the breast through either breast-conserving surgery or mastectomy frequently leads to problems during the recovery period, such as anxiety, depression, body/self-image issues, distress, sexuality challenges, and low self-esteem. In addition, breast cancer patients often choose to avoid reconstructive surgery because of the cost, their physical condition, or the additional recovery time and complications. External breast prostheses have been proven an effective solution for women who haven't had (or won't have) reconstructive surgery, and it is used by up to 90% of women after surgery in Western countries. Even so, problems including comfort, unnatural appearance, and cost prevent many women from using them. These problems can be addressed through customized, 3D-printed breast prostheses. Materials selections have improved substantially, with several thermoplastic elastomers and polyurethanes on the market, and many other flexible materials are under development. Patient comfort, appearance, and breast shape issues can be satisfied with custom sizing and the correct selection of 3D printing material (possibly including post-treatment with silicone or another coating). Finally, a distributed manufactured prosthesis can cost significantly less than a custom commercial solution. 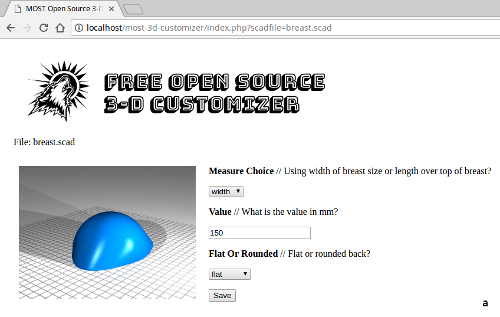 Using the Free Open Source 3D Customizer to custom-design breast prosthetics is easy and straightforward. The breast size can be measured in two ways: the width of the breast (B), for the desired width of the prosthetic, or the length over the top (L) of the breast, as shown below. The breast measurement can be taken by length or width. The user can choose one of two customizable methods (by drop-down menu), and insert any value, in millimeters, into the text box. The user also has the option to choose either a flat or rounded back (using a second drop-down menu). The flat back makes it easier to print without support on a 3D printer, while the rounded back would be more comfortable for the wearer. Customizing the breast prosthetic's size using the flat width measurement setting. 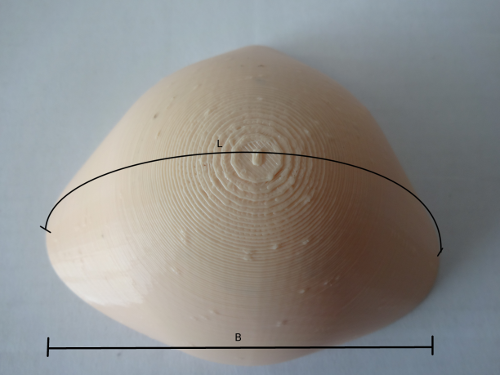 Customizing the breast prosthetic's size using the rounded length measurement setting. Users can design the perfect breast prosthetic by easily prototyping different designs and fills. The Free Open Source 3D Customizer could also be used to help women with partially intact or uneven breasts, and even those who simply want a custom bra insert to change their breast appearance without surgery. In addition, 3D printing's partial infill options enable a degree of customization not possible with mass-produced products. This can be done with the use of an open source slicer, such as Slic3r, which can ensure variable step wall thickness to eliminate z step lines. With these methods, users can vary the density of the breast prosthetic for optimal comfort and a natural look and feel. This demonstration is a first step in an open source design for a breast prosthetic. For more information about the Free Open Source 3D Customizer or to add it to your own repository, please visit the project's GitHub page to access the source code.